There is literally thousands of ficus varieties, so it would take more than just one page to cover them all. From what I have discovered so far figs in general make great bonsai because of there natural tendency to be very forgiving when it comes to care. You can over water, under water them, position them in poor light and as long as you realize before it is too late, most fig varieties will forgive you and begin to flourish again as soon as you rectify the situation. 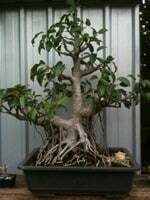 Most ficus bonsai varieties happily throw aerial roots, grow thick trunks quickly and respond well to harsh pruning. Figs are perfect for any one just starting or wanting to learn how to bonsai, as they have all the elements necessary to be able learn from. Cut back foliage to 2 leaves in spring and autumn to encourage growth back on old wood as well as creating thick pads of foliage on established branches. Wire at will but watch for wire cutting in as branches thicken quickly in growing season. Healthy figs can be completely defoliated up to twice a year to encourage the production of smaller leaves. 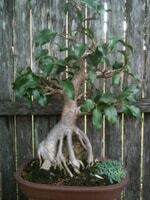 Ficus Bonsai seem to thrive in most conditions. Ideal positioning is full sun to semi shade. Water normally by checking soil moisture. Add a hand full of slow release fertilizer when re potting in spring. Fertilise with fish emulsion, seasol or other organic liquid fertilizer every 14 to 30 days during the growing season. Every year at the beginning of spring for best results. Can be re potted at any time of year with good after care. 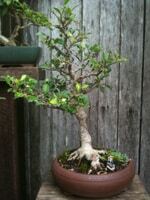 The maintenance of ficus bonsai is relatively easy. Pinching out of vigorous growing tips during spring and summer and pruning hard at re potting time, will encourage strong back growth. Caterpillars, mealy bugs and scale insects seem to be the worst of the figs problems. Being vigilant and checking for signs of the leaves being stuck together usually near the tips where the growth is fresh, will usually spot caterpillars settling in before they become a problem. Trails of ants will usually show up scale insect and mealy bugs before they become an issue. Most pests on the figs can be controlled with a spray of white oil or pyrethrum. Spraying figs monthly during winter with lime sulphur can help to control pests in hiding. 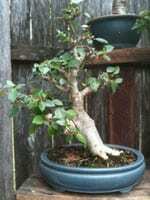 All information on this website is based entirely on my 20 years of experience growing bonsai on the Northern New South and South East Queensland coasts of Australia. 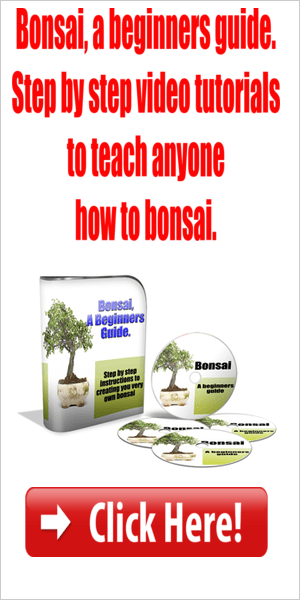 Results may vary when bonsai are grown in other locations or conditions.